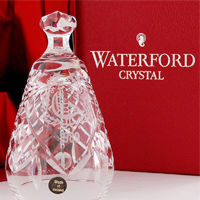 Even though Ireland is a small country, it has a distinct culture all its own, and a distinctive cuisine as well. Irish cooking takes its inspiration from the ingredients that have sustained its population through good times and bad over the centuries: cabbage, lamb, pork, wheat, dark beer and, of course, potatoes. Because most of these ingredients are inexpensive and widely available, traditional Irish dishes are enjoyed by people in all walks of life, both rich and poor, urban and rural. The following ten dishes are some of the most beloved and familiar dishes eaten at home and at restaurants or taverns throughout Ireland. Irish Stew is one of those dishes that are made a little bit differently by every cook in every part of Ireland. Stewed meat and root vegetables are the common denominators, but the meat can be lamb, mutton or beef, and the vegetables can include carrots, turnips, onions and potatoes. 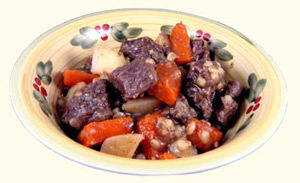 The stew is cooked for several hours to make sure the meat is tender and flavorful. Some cooks even pour in some Guinness stout for a little extra zing. Boxty is Ireland's answer to that world-wide favorite dish: potato pancakes. It seems many cultures have their own version, but what makes Boxty distinct is the combination of both mashed and grated potato. 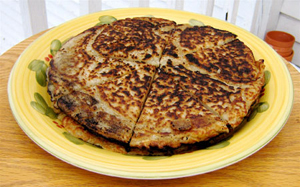 You can have Boxty for breakfast, as a side dish, or even wrapped around a filling like a flatbread. When you combine all of the favorite ingredients of Irish culture, you're bound to come up with something delicious, and that delicious dish is called Colcannon. A mixture of mashed potatoes, cabbage or kale, onions or leek and sometimes bacon, Colcannon is Irish comfort food at its very best. Dig a hole in the top of your Colcannon and pour in melted butter to create an especially decadent treat. Throughout Irish history, small farmers sustained themselves on what they produced, and almost every farm had its own pigs and grew its own cabbage. Thus Bacon and Cabbage was born. This dish usually uses back bacon, which is not smoked or sliced, but smoked bacon is also used. 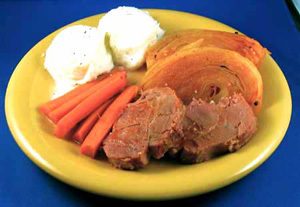 When Irish immigrants came to the United States, cooks found corned beef more readily available than back bacon. This means that Corned Beef and Cabbage is actually an Irish-American dish, a stand-in for the authentically Irish Bacon and Cabbage. 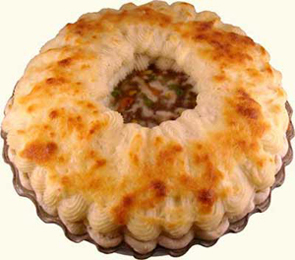 Shepherd's pie, a popular dish throughout the British Isles, came about when the potato was brought from South America as a cheap and nourishing food staple. Shepherd's pie incorporates a crust of mashed potato--rather than pastry--over a thick, stew-like filling. Either ground beef or lamb can be used along with potatoes and vegetables. The presence of baking soda rather than yeast is what characterizes Soda Bread. The baking soda allows the baker to use the softer wheat that grows well in Ireland, rather than the hard wheat needed for yeast bread. Unlike the soda bread seen in America and elsewhere, traditional Irish Soda Bread is a plain white or brown loaf that does not contain fruit or raisins. Soda Bread can be formed into large round loaf or flattened and cooked on a griddle. These flattened cakes are called Farl. For many Irish people, the coming of spring means it's time to enjoy a slow-roasted leg of lamb. Sheep have long been more common and affordable than beef cows in Ireland, and lamb makes a tender and flavorful roast. Served alongside fresh spring peas, tiny new potatoes and a tangy mint sauce, this dish could hardly be more emblematic of the excellence of Irish cuisine. Guinness Stout is practically the national beverage of Ireland, so while a Chocolate Guinness Cake isn't especially traditional, it is very Irish. 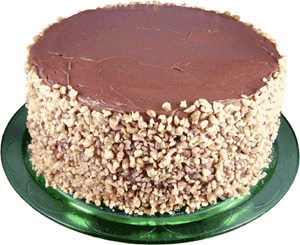 The dark beer gives the cake an extra-rich flavor and the alcohol evaporates, so you don't have to worry about letting kids try it. A fluffy white icing on top of the cake is reminiscent of the creamy foam on a pint of stout. Salmon is a favorite fish in Ireland, and people come from all over the world to fish for salmon in Ireland's crystal-clear rivers. Irish salmon fishing season opens on March 17th, St. Patrick's Day, which makes Roasted Salmon the perfect Irish entree. 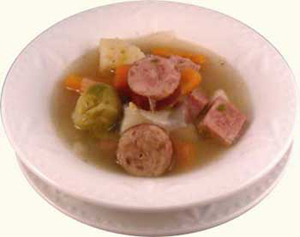 Many cuisine over the world have a special name for a dish made of leftovers, and in Ireland it's Dublin Coddle. This homey dish is made from sausages, bacon, onion and potatoes, layered together and cooked slowly in broth. To many Irish people, the taste of Coddle is the taste of home.